Sydney museum-guides.com - Sydney, Australia museums guide Sydney Australian National Maritime Museum information, historic exhibits, Aboriginal canoes, displays about First Fleet, surf culture, artefacts, address and location of Sydney Australian National Maritime Museum, Murray Street, Darling Harbour, Central Business District (CBD), Pyrmont Bridge, tel / telephone number, open hours, admission charges, and general information about Sydney Australian National Maritime Museum in Sydney area, New South Wales NSW, Australia - Last updated 30/10/2012. Australian National Maritime Museum, situated in Sydney's Central Business District, is difficult to miss, standing at the western end of Pyrmont Bridge. With sail-like roofs, which resemble the famous Sydney Opera House, the Australian National Maritime Museum tells the rich story of Sydney's historic relationship with the sea. 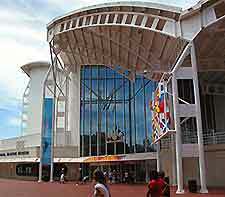 Featuring Aboriginal canoes, displays about the arrival of the First Fleet, information on Sydney's world-famous surf culture, numerous historic artefacts, regular guided tours, a gift shop, café area and a variety of moored boats, Sydney's Australian National Maritime Museum is located close to the Harbourside monorail.